We take DACs (digital analogue converters) for granted, but all of our digital music must be converted before our floppy analogue ears can hear it and you'll be amazed at the difference that bypassing your laptop's soundcard with a dedicated DAC/headphone amp can make. The Cambridge Audio DacMagic XS is the smallest and lest expensive we have come across, but even though it costs twelve time less than the uncompromising Chord Hugo, it still has an almost magical effect on your digital music - hence the name. But before going any further, we should probably point out that unlike Hugo, DacMagic XS does not work with mobile devices as it requires power over USB, so you can forget about connecting your iPhone 5S or Samsung Galaxy S4 right now. There are ways to get around this with a powered USB hub, but it's messy and Cambridge Audio does not recommend it. The Cambridge Audio engineers have managed to shrink this 16-bit DAC and 150mW amplifier into a wee slither of brushed aluminium that'll slip into your jeans pocket, or laptop sleeve. 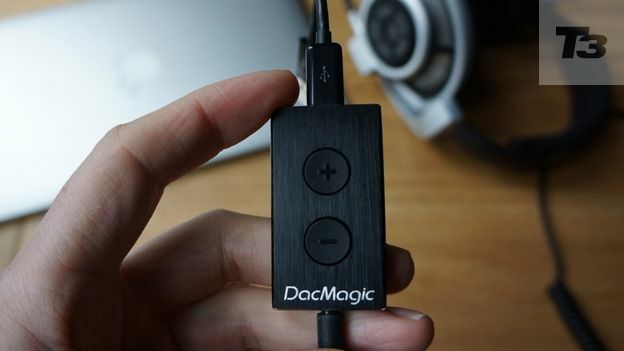 The logic being that you can keep the DacMagic XS on you and plug it into any (powered) USB port you come across and never have to suffer quiet headphones or sloppy digital sound conversion again. Drawing power via USB rules out mobile devices, but removes the bulky battery compartment. And with just two buttons to turn the volume up and down and one minute LED it couldn't be any less complicated. That single LED indicates that it's working, but also flashes when the volume reaches minimum or maximum and changes colour according to the sample rate going in. It's a refreshingly simple device that just wants to enhance your listening pleasure without adding further complication. The DacMagic XS is here for just one thing; to process the sound between your digital device and your analogue headphones, so don't expect it to store music, or brew tea. However, there is more to this unassuming black box than meets the eye. Press and hold both buttons together and that microUSB 1.0 port becomes a microUSB 2.0 port. Why? Because the older standard supports older USB devices and draws less power when you're listening to standard-resolution music. Switching to the later USB standard allows you to hear any high-resolution music files you might have on your laptop. For Mac users, setup really couldn't be simpler. Just plug DacMagic XS into your laptop's USB port, choose the device that will have popped up in your sound output options and away you go. PC users hoping to use the HD USB port might need to download the free driver. Then it's a simple case of pressing volume up to make it louder and volume down to, well you get the picture. Be warned though, Cambridge Audio reckons the maximum output is ten times that of your average laptop soundcard and with no volume display (just a blink of the LED to indicate that you've reached max or min) there's a danger of blasting your eardrums by mistake. So does this mysterious dongle really make your music sound better? In a word, yes. Even when you match the volume of your laptop's own output and the DacMagic XS, there's a very real and audible difference between the two. It has the effect of snapping the sound into focus, so that instruments sound tighter and more realistic. Fizzy sibilance around symbols and snares sharpens into proper, lifelike percussion and orchestras fill the soundstage in a much more convincing way. Every aspect of the music is subtly improved. Headphone amplification and digital analogue conversion are not priorities for laptop makers, so we shouldn't be so surprised that a dedicated DAC will do a better job. What's remarkable is how much difference an inexpensive headphone amp like this can make to your digital music, especially the high sample rate stuff. Delve into the audiophile's world of lossless audio coding and you'll find lots of rather large, but superbly produced and encoded music that sounds exquisite through the DacMagic XS and a pair of reference-quality Sennheiser HD800 headphones. Try the 24bit/192kHz FLAC excerpts from Vivaldi L'Amore per Elvira by La Serenissima available for free download at LinnRecords.com [http://www.linnrecords.com/linn-downloads-testfiles.aspx] and you'll see what we mean. The DacMagic XS reveals appreciably more detail than our MacBook's own headphone socket can achieve and without any unwanted background noise. If you thought external DACs were the reserve of hi-fi purists, think again. The Cambridge Audio DacMagic XS adds depth and detail to your digital files that you didn't know existed. More importantly, it'll retrieve this extra data for less money than your average headphone amp. It seems a shame to exclude iOS users and a volume indicator would have been appreciated, but you have to admire the simplicity of the DacMagic XS.